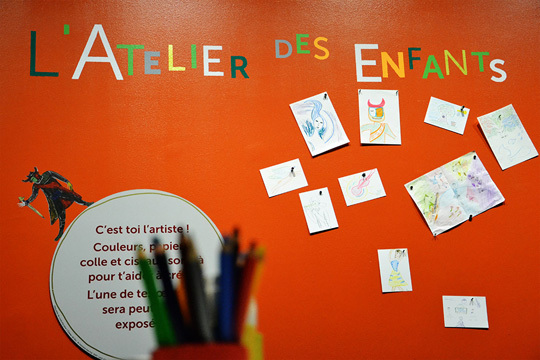 La galerie-atelier pour les enfants est terminée. After the success of the Klee en mains, workshop organised in conjunction with the Paul Klee, Polyphonies exhibition (2011/2012), the Philharmonie de Paris is pleased to present an educational children’s area to accompany the Marc Chagall: The Triumph of Music exhibit. The Little “Chagall’s Box” is a space in which the public can express their creativity and delve into the artist’s dreamlike universe. The Little “Chagall’s Box” offers creative workshops and fun modules for families with children ages 4 to 12. For families with children ages 4 to 12. Children are under the responsibility of the adult(s) accompanying them. Unaccompanied children are not admitted. The activities are accessible to visitors with disabilities. The other days of the week are reserved for school groups. In the early 1920s, Chagall was commissioned to create the décor at the Jewish Theatre in Moscow. He painted a total of seven panels, in which music is incarnated by the famous green-faced violinist, and which include an enormous eight-metre-long mural filled with musicians, dancers and acrobats. This site became known as “Chagall’s Box” – a name our children’s area has borrowed in homage to the painter. A 350 sq.m. children’s area. A fun educational area relating to the Marc Chagall exhibition. A place for parents and children to interact and spend time together. A museum mediator to welcome you and guide activities. Observation, experimentation, and memory games. A little theatre with costumes for make-believe. Modules accessible to visitors with disabilities. Exploring the connections between music and painting. Discovering the musical works tied to Chagall’s art. Encouraging creativity and create works to bring home. Learning to observe artworks in a fun way. Understanding the different stages in the painter’s work. Exploring the wide range of techniques used by Chagall. Making the artworks accessible to blind and partially-sighted visitors. Developing corporal expression in relation to the visual arts and music. Thanks to the Google Art Project, children can “browse” the ceiling of the Paris Opera House. They can explore the painted work up-close, looking for figures, extraordinary animals, monuments, and delightful details as their exploration is displayed on a large screen. Three activity tables for drawing, collages, modelling and more. This area is coordinated by a museum mediator. Children are invited to hang their drawings on the walls or to bring them home. Using an interactive interface, visitors can play with the Green Violinist. Change the colours of the painting and the size of the characters… When the painting is complete, the visitor hears a selection of Klezmer music. The instruments represented in Chagall’s paintings come to life in this fun installation. Visitors can touch cellos, clarinets, flutes and trumpets that have been painted different colours, as the installation’s specially designed soundtrack plays in the background. Compose and decompose your own painting on a big backlit table. Characters, animals, monuments and blocks of colour are outlined and printed on transparent sheets. Visitors can handle, arrange and overlap the different components to create their own ephemeral works of art. A little theatre where a museum mediator leads short workshops. 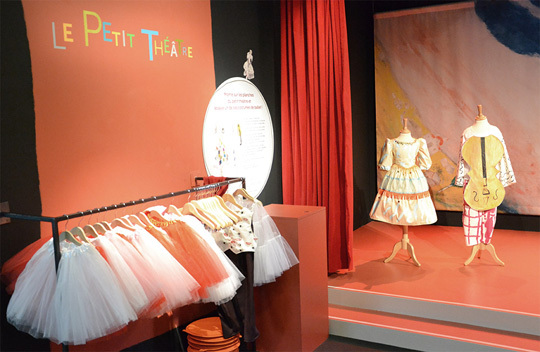 Young visitors can try on costumes inspired by those Chagall designed, and then take to the stage, just like at the opera! 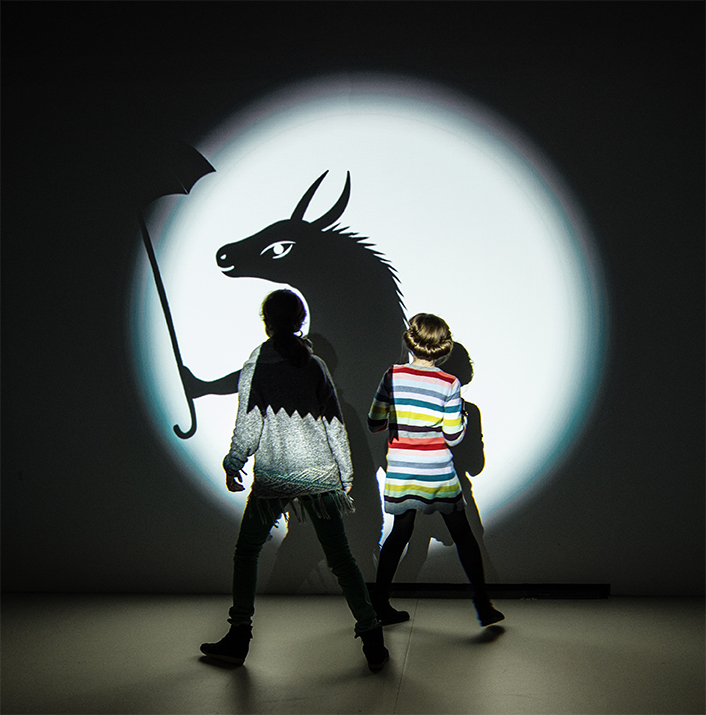 A fun digital installation where masks of incredible animals mix with your shadow, creating a sort of fable in which your shadow is no longer your own. Camille Scherrer’s installation In the Woods has been adapted to Chagall’s universe to offer visitors this experience. In conjunction with Marc Chagall: The Triumph of Music et de The Little “Chagall’s Box”, de many activities in our activity brochure are also being offered for school groups, and guided tours and storytelling tours are available for individuals.